FUEL EFFICIENT 24 MPG Hwy/17 MPG City! 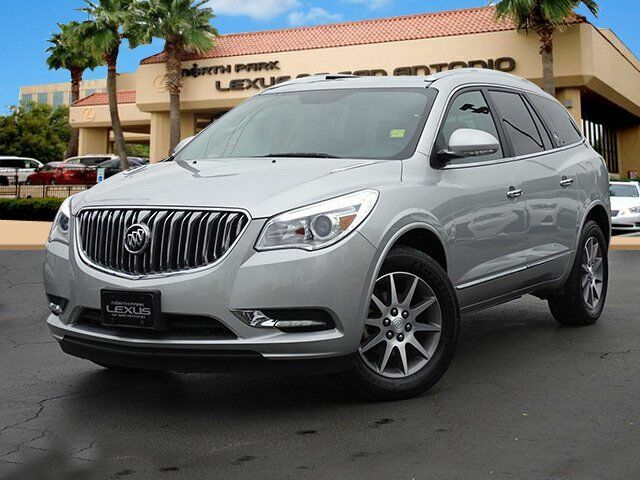 Heated Seats, Third Row Seat, Back-Up Camera, Onboard Communications System, Rear Air, Cross-Traffic Alert, Dual Zone A/C, Remote Engine Start, AUDIO SYSTEM, COLOR TOUCH RADIO WITH.. SEE MORE! Third Row Seat, Quad Bucket Seats, Power Liftgate, Rear Air, Heated Driver Seat, Back-Up Camera, Onboard Communications System, Aluminum Wheels, Remote Engine Start, Dual Zone A/C, Cross-Traffic Alert, Blind Spot Monitor, HID headlights, Heated Seats Privacy Glass, Keyless Entry, Remote Trunk Release, Child Safety Locks, Steering Wheel Controls. AUDIO SYSTEM, COLOR TOUCH RADIO WITH INTELLILINK, AM/FM/SIRIUSXM RADIO WITH CD PLAYER 6.5" diagonal touch-screen display, USB port and auxiliary input jack (STD), TRANSMISSION, 6- SPEED AUTOMATIC, ELECTRONICALLY CONTROLLED WITH OVERDRIVE (STD), ENGINE, 3.6L VARIABLE VALVE TIMING V6 WITH SIDI (SPARK IGNITION DIRECT INJECTION), DOHC (288 hp [214.7 kW] @ 6300 rpm, 270 lb-ft of torque [364.5 N-m] @ 3400 rpm) (STD). Buick Leather with Quicksilver Metallic exterior and Ebony interior features a V6 Cylinder Engine with 288 HP at 6300 RPM*. Electronic Stability Control, 4-Wheel ABS, Tire Pressure Monitoring System, 4-Wheel Disc Brakes Great Gas Mileage: 24 MPG Hwy. "Smooth and quiet ride; luxurious cabin; generous cargo capacity; seating for up to eight; top safety scores." -Edmunds.com.